The evolution of biological research has resulted in numerous experiments which, in turn, have produced a large volume of raw biological data. This effect has created demand for additional storage capacity as well as for for the capability to manage and search through these large biological data sets. 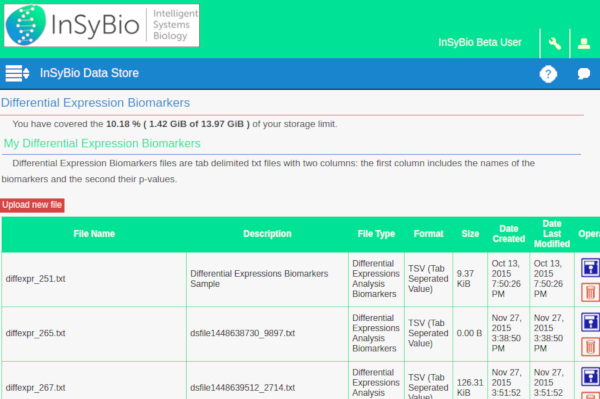 InSyBio Datastore supports biology researchers with web-based tools for management, storage, and analysis of their experimental data. InSyBio Suite allows its clients to upload their data while a management feature helps them to classify and annotate it for easier search and retrieval. Backup and security policies ensure data integrity and availability, while a set of format conversion tools allows users to export their data in various standardized formats for further analysis. InSyBio Datastore provides technology security measures for safe data transfer and storage to its servers in order to protect client’s data. These include SSL and SSH secure data transmission protocols over the web, password-secured authentication mechanisms to access data, and strict security policies. Additionally, a personalization mechanism ensures that clients will have the only access to their proprietary data.